Hi everyone! If you are looking for stocking stuffer ideas I have a quick embroidery project that I whipped up this weekend. 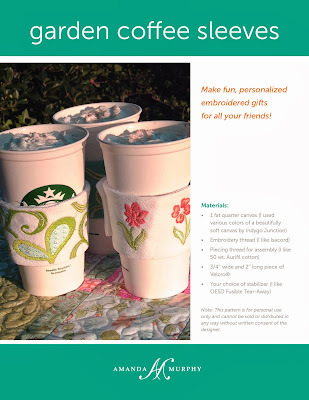 Machine embroidered coffee sleeves! (I also included graphics you can trace in the pdf pattern if you prefer hand embroidery. No instructions for specific stitches for hand embroidery but you will have something to trace.) I made these on the Bernina 780. These coffee sleeves are really simple to make and have a Velcro closure. 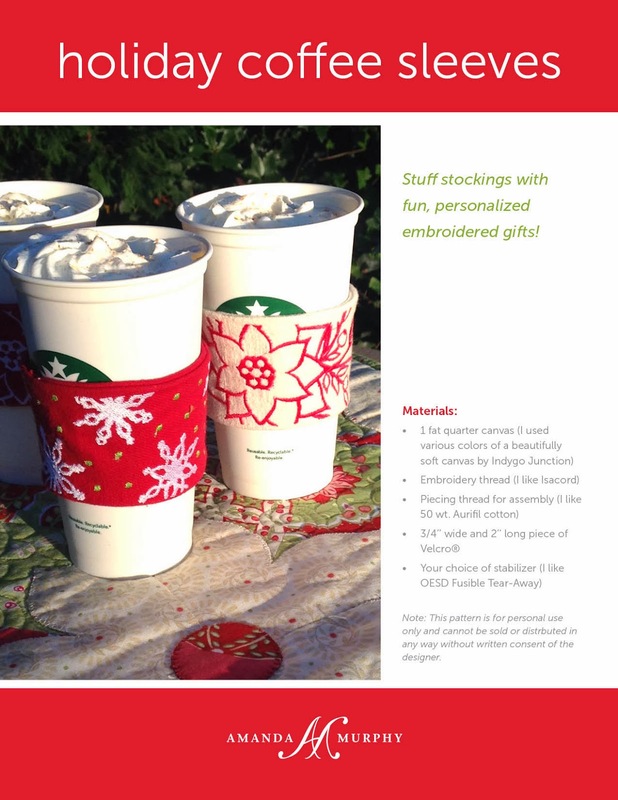 I made a poinsettia and a snowflake design for the Holiday Coffee Sleeves. And for those who just can't wait unit spring, I made a flower and paisley design! (Excuse the lighting - I was fighting the end of the day and the sun was really low in the sky and then my camera battery died so I had to use my cell phone...) Which do you like best? Right now I think the Snowflake is my favorite but that is probably because of the lovely red canvas from Indygo Junction. All the canvas is from Indygo (they make a wonderful, buttery-soft one that is great to work , the embroidery threads are Isacord, and the sewing thread is Aurifil 50 wt. cotton. Oh - and they ll fit in a 145 mm x 25 mm hoop. File types are: ART, HUS, PES, PEC, SEW, and VIP. You can find the patterns using this link or by clicking the button on the left hand side of my blog. I can't believe it is less than a month until Christmas - where did time go? Hope you had a lovely weekend with lots of sewing! Craftsy is having a flash sale this weekend! Craftsy giveaways: two winners and one more try! Elegant Embroidered Quilts... on Craftsy!